The family of B vitamins play a vital role in cell metabolism and the formation of red blood cells. They also help your body to use and create energy from the foods you eat. You can get B vitamins from proteins such as fish, poultry, meat, eggs, and dairy products. 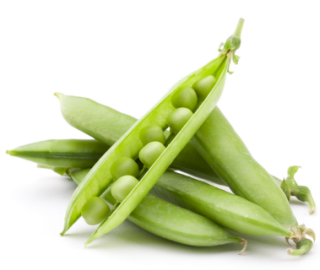 Leafy green vegetables, beans, and peas also have B vitamins. Many cereals and some breads (labeled fortified) have added B vitamins. If you are grocery shopping for foods that contain B vitamins, below you’ll find a breakdown of the essential B vitamins, their individual benefits, and their most common food sources. Vitamin B1 (Thiamin) – Thiamin allows the body to process carbohydrates and some proteins. Vitamin B1 can be found in: whole grain, enriched fortified products, bread and cereals. Vitamin B2 (Riboflavin) – Riboflavin is key in metabolism and in the conversion of food into energy; it also helps to produce red blood cells. Vitamin B2 can be found in: milk, bread products, and fortified cereals. Vitamin B3 (Niacin) – Niacin assists in digestion and the conversion of food into energy; it is also important in the production of good cholesterol. Vitamin B3 can be found in: meat, fish, poultry, enriched and whole grain breads, and fortified cereals. Vitamin B5 (Pantothenic Acid) – Pantothenic Acid is important in fatty acid metabolism. Vitamin B5 can be found in: chicken, beef, potatoes, oats, cereals, and tomatoes. Vitamin B6 (PYRIDOXINE) – Vitamin B6 is important for the nervous system; it also helps the body metabolize proteins and sugar. Vitamin B6 can be found in: fortified cereals, fortified soy products, and organ meats like liver. Vitamin B7 (Biotin) – Biotin helps the body synthesize fats, glycogen and amino acids. Vitamin B7 can be found in: liver, fruits, and meats. Vitamin B12 (Cobalamin) – Cobalamin is important in the production of red blood cells. It also helps in the maintenance of the central nervous system. Vitamin B12 can be found in: fish, poultry, meat, and fortified cereals. 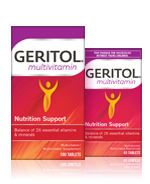 If you’re having difficulty incorporating all of the foods listed above into your diet, Geritol® multivitamin contains 100% of the recommended daily value for vitamin B1, vitamin B2, vitamin B6 and vitamin B12, plus niacin and folic acid – all in one easy-to-swallow multivitamin pill. B Vitamins. November 07, 2012. U.S. National Library of Medicine. Retrieved from: http://www.nlm.nih.gov/medlineplus/bvitamins.html January 2, 2013. Food Sources for Vitamins and Minerals. 2005-2013. WebMD, LLC. Retrieved from: http://www.webmd.com/food-recipes/guide/vitamins-and-minerals-good-food-sources January 2, 2013.